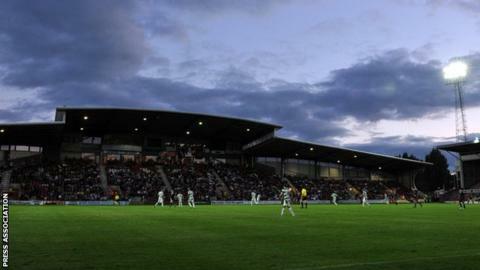 Wrexham FC supporters have voted in favour of a plan to sign a 99-year lease on the Racecourse stadium. Glyndwr University bought the ground and fans group Wrexham Supporters' Trust took over the club when it got into difficulties in 2011. The board said it was the right time to reacquire the stadium and the members voted in favour on Tuesday evening. The trust is now asking fans to help raise £200,000 to turn the stadium into a profitable business. In a statement issued in early March, the university said the move would allow the club to "thrive and grow, both on and off the pitch". The deal does not include Colliers Park training ground. The Centenary Club, next to the stadium, will continue as the students' bar. Wrexham chief executive Don Bircham told the club's website he was "absolutely delighted" by the news. "To take ownership of the football club some years ago and now get our historic stadium back is absolutely fantastic," he said. "It's been under utilised so the commercial opportunities are massive and I'm sure we'll make use of those assets."